Want to Buy the Blogging Experiment Theme? 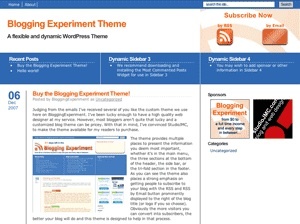 The famous Blogging Experiment theme is now up for sale for use on your blog. It’s been getting quite a bit of attention due to its clean setup and wide columns suitable for on-site advertising. The theme comes in two different flavours, the original blue/orange or the new blue/green variant. The theme is completely widgetized and fully customizable. Each trifold section (header and footer) as well as the sidebar can be altered by making use of the amazing drag and drop aspect of WordPress widgets. In the future, different variations of this theme may come up, such as design changes and more colour options. Those who purchase the theme will receive these updates free of charge. Yahoo! declined Microsoft’s offer this week to purchase the #2 search engine. Yahoo!’s management team and financial and legal advisors have unanimously concluded that the proposal is not in the best interests of Yahoo! and our stockholders. Basically this means that Yahoo! doesn’t feel Microsoft’s offer was high enough. No word yet as of Microsoft’s next move. Meanwhile, earlier this week Microsoft busted out the check book for another reason, to acquire Danger Inc.
SEO Meter is a new free tool you can use to see how often your site gets crawled by search engines. In order to monitor your site information, you need to submit your site for inclusion in their database. Only top level domains are accepted and your site can’t be under construction or just contain some slop you put up quickly. SEO Meter also accepts Blogger blogs. If you want to find out more about crawl statistics and how exactly you’ll benefit from finding out this information about your site, take a look at their FAQs page. Hmm I like the Blogging Experiment theme…would I be able to tweak it to my liking like the cutline? 😯 I guess all themes can be tweaked. I mean different marketing approach….